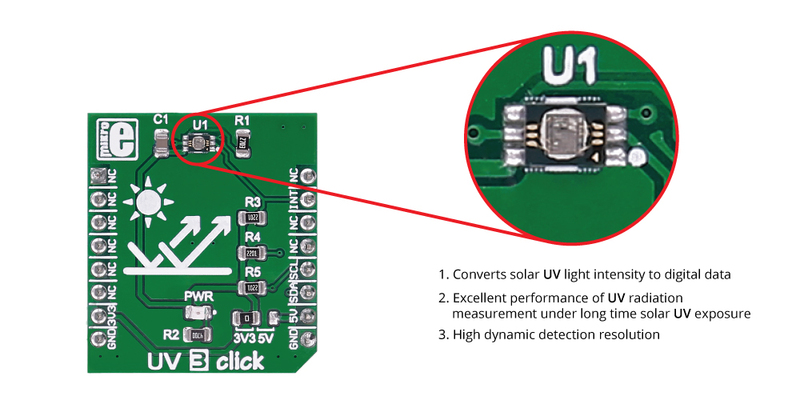 UV 3 click is an advanced ultraviolet (UV) light sensor with I2C protocol interface. The click carries VEML6070 UVA light sensor designed by the CMOS process. UV 3 click runs on either 3.3V or 5V power supply. VEML6070 is an advanced ultraviolet (UV) light sensor with I2C protocol interface and designed by the CMOS process. The active acknowledge (ACK) feature with threshold windows setting allows the UV sensor to send out a UVI alert message. VEML6070 incorporates a photodiode, amplifiers, and analog/digital circuits into a single chip. VEML6070’s adoption of Filtron™ UV technology provides the best spectral sensitivity to cover UV spectrum sensing. It has an excellent temperature compensation and a robust refresh rate setting that does not use an external RC low pass filter. VEML6070 has a linear sensitivity to solar UV light and is easily adjusted by an external resistor.